Contents tourism is tourism induced by the contents (narratives, characters, locations and other creative elements) of films, novels, games, manga, anime, television dramas and other forms of popular culture. Amidst the boom in global interest in Japanese popular culture, the utilization of popular culture to induce tourism domestically and internationally has been central to the "Cool Japan" strategy and, since 2005, government policy for local community revitalization. 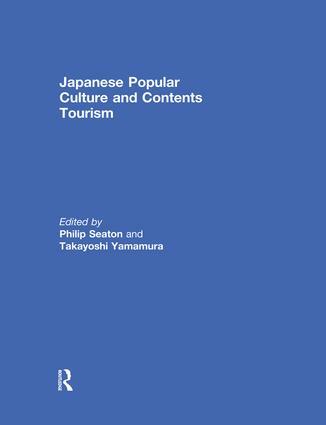 This book presents four main case studies of contents tourism: the phenomenon of "anime pilgrimage" to sites appearing in animated film; the travel behaviours and "pop-spiritualism" of female history fans to heritage sites; the collaboration between local community, fans and copyright holders that underpinned an anime-induced tourism boom in a small town north of Tokyo; and the large-scale economic impacts of tourism induced by NHK’s annual samurai period drama (Taiga Drama). It is the first major collection of articles published in English about media-induced tourism in Japan using the "contents tourism" approach. This book will be of particular interest to students and researchers of media and tourism studies in Asia. This book was previously published as a special issue of Japan Forum. Philip Seaton is a Professor in the Research Faculty of Media and Communication, Hokkaido University, where he is the convenor of the Modern Japanese Studies Program. He is the author of Japan’s Contested War Memories (Routledge, 2007), Voices from the Shifting Russo-Japanese Border (Routledge, 2015, co-edited with Svetlana Paichadze) and numerous articles on war and memory in Japan. Together they edit the International Journal of Contents Tourism.